Samsung, the South Korean smartphone maker, is one of the most influential names in the global smartphone industry. From cheaper to flagship, the company covers all the range of smartphone, in order to dominate the market. With its mid-range smartphones, Samsung especially targets the Asian market where consumers’ requirements are non-identical to the international market. Now, the company has launched Samsung Galaxy A6 Plus in India that comes with some impressive specifications on paper. Galaxy A6 Plus is a big screen fancy smartphone that holds a powerful camera and incorporates some latest features. Samsung spends almost $60 billion on R&D every year to understand the user behavior and make the devices according to their needs. Now, the company claims Galaxy A6 Plus to be the result of those expenditures. I have been testing the device for a week now, and its performance is impressive. The A6 Plus is mainly for the users who like to be upfront with all the latest apps and features. Let’s see if the phone worths its price or Samsung failed to understand what we want. Samsung Galaxy A6 Plus comes with a considerable makeover comparing to the other A-series smartphones. The Samsung phone owns an 18.5:9 aspect ratio that is possible due to the smaller bezel and disappearance of the home button. This makes A6 a full front display smartphone that uses the AMOLED screen for its full HD+ resolution support. Samsung used metal instead of glass to make the phone more attractive. The metal gives more shine and premium look to A6 over other smartphones available at similar price. Moreover, the metal body is also safe against the fingerprints or marks, unlike the glass design. There is a new home for the antennas that you will notice in D-shape at the top and bottom of the phone. The back of the phone comprises a dual camera along with the fingerprint sensor contained in a capsule shape together. The top of the phone has nothing, whereas the right side of the phone is pretty crowdy containing the volume key, two separate slots for SIM cards and a slot of microSD card. The power key and the lock button is situated on the right side along with the speaker grill. At the bottom of the phone, there is micro USB port and a 3.5mm jack. Samsung Galaxy A6 Plus sports a 6.0 inch AMOLED display that comes with 1080 x 2220 pixels support for FHD+ resolution. To match up with the ongoing trend, Samsung gave Galaxy A6 Plus 18.5:9 aspect ratio. The ‘always on’ display of the Samsung phone is bright and provides impressive experience while interacting with apps. Galaxy A6 Plus runs on Qualcomm SDM450 Snapdragon 450 chipset that we found quite powerful. The chipset of the phone is coupled with an Octa-core (1.8 GHz Cortex-A53) processor. During the testing period of one week, the phone performed well against every task. I also installed some hefty apps to make Galaxy A6 Plus work slow, but it surprised me with the performance. There was no issue while switching between the number of apps. The processing power of the phone accompanied by 4GB RAM and 64GB internal storage. 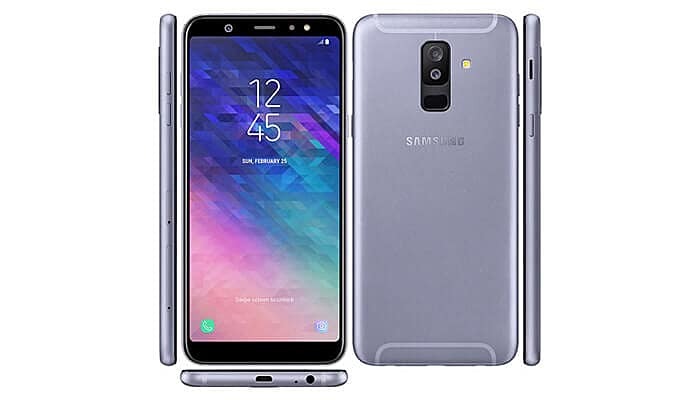 However, there is another variant of the Samsung phone that comprises 3GB RAM with 32GB internal storage, but we have tested only the Galaxy A6 Plus with 4GB RAM. The Samsung Galaxy A6 Plus camera is quite powerful compared to its predecessor and comes with more stabilized autofocus. The rear dual camera uses a 16MP lens having f/1.7 aperture as the primary camera and a 5MP lens having f/1.9 aperture for capturing high quality images. The images that we have taken with the Galaxy A6 Plus camera were quite sharp and came out with more depth in color. The rear camera offers Geo-tagging, touch focus, face detection, panorama, and HDR. Besides, there is a 24MP powerful selfie booster for the selfie lovers to fill their social media profiles with compelling images. The Samsung Galaxy A6 Plus comes with Android 8.0 (Oreo) right out of the box, and Samsung is planning to release Android 8.1 update soon. Besides, the phone is equipped with a non-removable 3500 mAh Li-Ion battery. Samsung Galaxy A6 Plus was launched alongside Galaxy A6 in May. The Galaxy A6 Plus comes with a price tag of Rs 25,990 and is available on Amazon to buy online. The Galaxy A6 Plus is undoubtedly the best smartphones in the entire line up of A series from Samsung till date. The phone comes with an impressive design that puts it in direct competition with OnePlus 6 and other mid-range smartphones. The Samsung Galaxy A6 Plus camera is amazing, and we are impressed by its quality images. The display of the phone also gets the thumbs up from our side for outstanding picture quality and support for wide angles. Overall the phone is good, but it comes with a hefty price tag for an entry-level chipset, so it will be tough decision to go for the Galaxy 6 Plus by ignoring other better options.